"Well ahead of schedule on her attempt to establish a new world record for seven days continuous cycling Mrs Valda Unthank was photographed at lunch with Ossie Nicholson the Victorian endurance cyclist. The image above was shot inside the premises of Austral Cycles where she also ate her meals and posed for the press. During her ride Mrs Unthank is also eating her meals in the window at the Metropolitan Gas Company's premises in Flinders street." During the 1930's Australia's record breaking female cyclists pedalled their way through nights without sleep, forging their own two-wheeled tracks into the roads of Australia. A pandora's box of impossibility lay ahead at every turn of their pedals. Riders waded knee deep through flooded rivers, encountered snakes, bouncing kangaroos, storms, strong winds and blazing heat. Each season they covered unthinkable distances, counted and recorded in multiples of hours, days, weeks or entire years! A private battle with only the will of the mind to see each painful long distance test through to it's full and final conclusion. In the name of record breaking and commercial gain, the press reported records set on number of kilometres covered in a specific time, fastest time for a specified distance and point to point or any combination of these three. One example of multiple records falling on a record ride was the "Paralysing Pedaller" Valda Unthank's 1938 attempt from Launceston to Burnie and return. 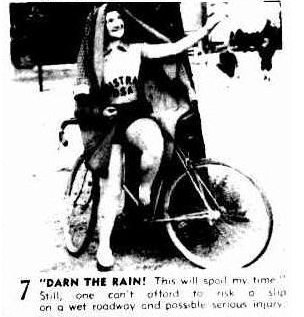 Valda Unthank increased the Australian and Tasmanian 200 mile record and 12 hour record, also bagging the record for Launceston to Burnie and return. To achieve the distance and time of twelve hours, the Paralysing Pedaller had to add a few kilometres to the end of her ride. The flurry of record breaking in the 1930's kept official time keepers from the various cycling unions busy. Recording a time at any distance or location on the map was fair game. Austral, Malvern Star and others bike company's like Navy Cycles kept Australia's record breaking female cyclists on a hefty schedule of public engagements. Record breaking rides proving to the nation that the sponsors bikes were solid and reliable. Off the bike appearances and commitments for the press involved match racing on rollers, or demonstration rides. Alongside riders like Hubert Opperman and Ossie Nicholson, Australia's top female record breakers became household names. Wet ink on record book pages barely had time to dry, before being erased and replaced with the next hard won record. Spanning the 1930's, to gain a racers edge, overnight sleep periods dropped from six hours to as little as ten minutes. Typifying the spirit of the period, when Doreen Middleton set her Melbourne to Adelaide record in 1931, the first two ladies ever to achieve the same record, Phyliss Sharman and Melba White, came to greet Middleton at the finish. Along the road a local bicycle enthusiast had asked Middleton a couple of questions, "Did you have any adventures?' …. 'No' she replied, and then, as an afterthought, 'A kangaroo nearly bowled me over in the Coorong.' 'Would you do it again?' 'Too right. I'm going to ride home." Despite riding 607 miles and almost being bowled over by a kangaroo, nineteen year old Miss Middleton still managed to look "fresh", "Miss Middleton, who arrived in the glare of headlights of cars driven by cycling enthusiasts who went to meet her, was fresh, pink-cheeked, pretty, and unhurried"1. Valda Unthank Valda Unthank's name stands out on an illustrious list of record breaker's, her contemporaries included fellow Victorians Doreen Middleton from Essendon, the 4ft 11in (150 cm) 7 stone (45kg) pocket rocket Miss Billie Samuel, Dot Edney of Wangaratta, and Elsa Barbour. Joyce Barry came to the fore from NSW, while over in Western Australia Jessie Pengilly and Pat Hawkins created huge tallies on the road. Up in Queensland, Edna Maggs of Brisbane was pedalling her way into the record books. Other notable riders of the era included Marjorie Smithenbecker, Norma Starbuck, Dot McLaren, Dot Hodgson, Shirley Hillman, Madge Stewart of Hobart, Mrs. M Cameron, Miss May McEntee, plus the earlier trendsetters Phyliss Sharman and Melba White. The World Record for seven days and nights of continuous cycling 1939. Valda Unthank briefly owned the twenty four kilometre stretch of road between Melbourne and Mordialloc. For seven days and seven nights she rode relentlessly back and forth, followed by a car, a caravan and Ossie Nicholson. Ossie managed Valda's brief rest periods, which totalled a mere fifteen hours in the seven day ordeal. Henry Gray a "skating expert"12 was contracted to hand up water bottles to Valda as she lapped backwards and forwards. Windows at the Metropolitan Gas Company and Austral Cycles, afforded the press and public a view as Valda and Ossie stopped by for meals. Austral Cycles installed a kitchen in their window and prepared the meals there for Valda's ride. 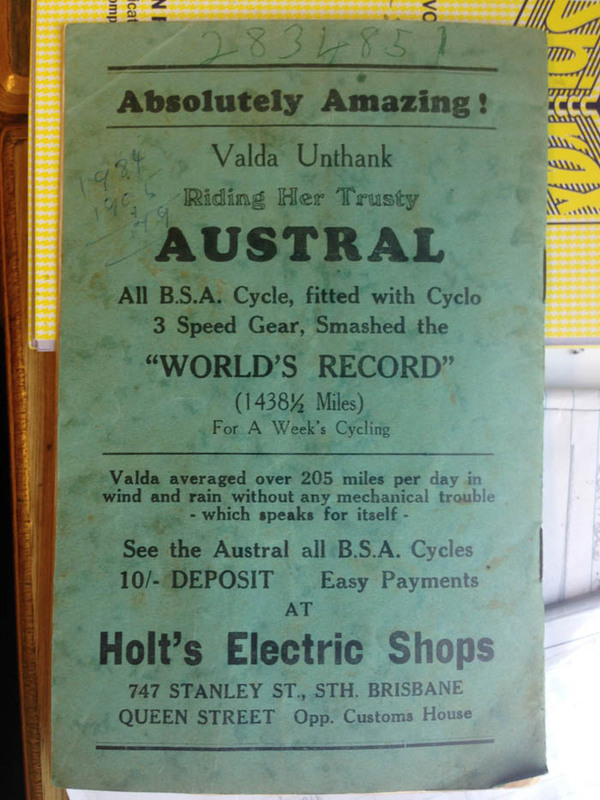 Arthur Dowse kept this Hawthorne Park velodrome race meet programme with an Austral advert for Valda Unthank's world record. With thanks to Joe Cosgrove, programme from his Arthur Dowse archive. During the closing hours of her ordeal, her thoughts were of hot baths and long sleep, …. she lost nearly a stone in weight and a couple of inches off the hips as well. Ten days before Valda Unthank announced her retirement from competitive cycling, Wally Kerr had answered the call from the Red Cross to hand in any old gold - To Help Win The War. Wally's old mate Nigel Barker went together with Wally to hand over his own precious gold pieces. Nigel was one of Australia's greatest runners of all time. Forty nine years after Wally Kerr won his gold medals racing on a penny farthing he handed them over to the Red Cross, to be melted and re-born as trophies for a race meeting at Randwick Racecourse. Nigel donated his gold watch and chain, which he'd treasured his entire life, to aid the war effort.20 Both Valda's retirement and Wally's selfless gesture signified a change in Australian cycling that would be amplified years later with the advent of television. The sport we know today owes much to these generations, yet their contributions remain largely unknown and ignored. "VAST HIPPODROME OF ACTION … Thousands of fearless riders.. Through Blistering Heat .. Under Blood-Red Skies … Into an Empire Ablaze With Primitive Passions.."
Soon we'll present the complete story of Australia's long distance record riders, and their very own and very special version of, a vast hippodrome of action. It's about time! Older PostQueensland Bike Trials at Rockatoo Esk, AUSTRALIA.